The background: I have been extremely fortunate to have had two healthy and uncomplicated out of hospital births with my previous children, something I never take for granted. 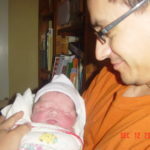 My first was at the now-closed Maternity Center birth center, and the second at home. Both had been pretty quick, the first time arriving at the birth center a few minutes before the birth (after a 45 minute car ride in rush hour in labor- not fun at all!! 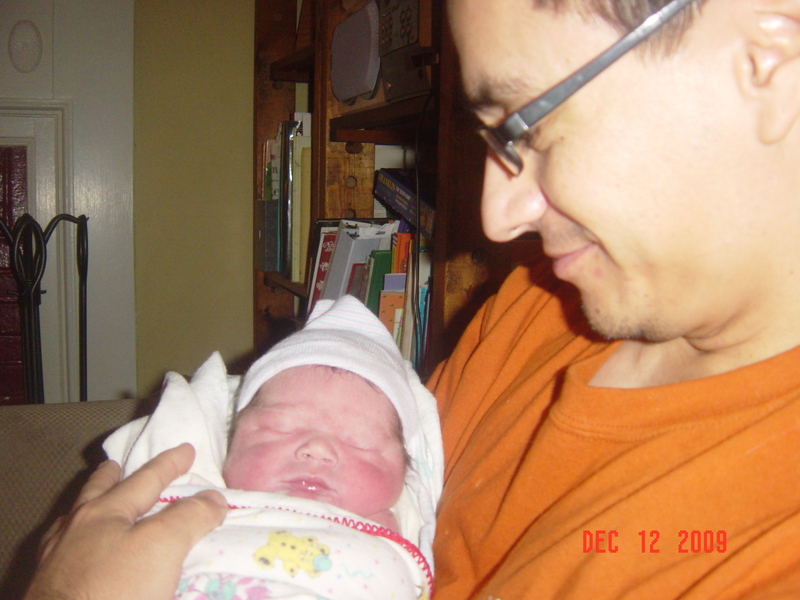 ), and the second born into my husband’s hands, before the midwife arrived. There was never a question that this birth would be at home, and I’m so grateful to my husband for being so supportive of homebirth and midwifery care. He took no convincing! My first birth had been surprisingly quite manageable and a wonderful experience (I was expecting the worst! ), but the second was very intense and painful, leaving me apprehensive about going through the birth experience again. It was very important to me to get the opportunity to be attended by midwives in labor. Even with 2 previous births with midwives, I had never actually had women with me during labor and really wanted the strength and wisdom they would bring. I was hoping to increase my odds of having them there by having midwives who live in my neighborhood! It was also important to me that I get to be in water for labor, as I had wanted that the previous times and it hadn’t happened. I woke up to some strong braxton-hicks type contractions. I hadn’t had many b-h during the entire pregnancy, but they had increased somewhat in the past couple weeks. I hadn’t had any other signs of impending labor and had never had any cervical checks during my pregnancy. I tried to relax and lay in bed and hope they went away, but it wasn’t working- I got up and had something to eat and drink, and read a magazine. I had to pace around, and couldn’t sit or lay back down. I kept staring at the clock to determine if the contractions were coming in any sort of pattern. They weren’t, but they were pretty frequent, anywhere from 2-7 minutes apart. I realized that staring nervously at the clock was probably not a great way to keep a positive attitude during what could be labor, so I decided to wake up my husband so we could hang out, and hopefully distract me and get me into a better mood. I was annoyed about being up in the middle of the night- I am not a night owl, and have had lifelong problems sleeping, so being up at 3am was really distressing and I was wishing the contractions would stop and I could go back to sleep and begin this again in the morning! The only thing I could do to cope at this point was to walk around very quickly, humming and trying to do Ina May’s “horse lips” technique. I was getting upset that I was expending so much energy pacing around, and only on a few hours’ sleep. I was worried I would wear myself out and be too exhausted by the time the birth got close. You can see a theme here…I really did not have the positive, joyful, welcoming attitude I had hoped to have during labor. I cried to my husband that I couldn’t believe this was happening, that I really didn’t want to be doing this. I just wanted to go back to bed and start over. I didn’t feel like I had the emotional strength to do what had to be done. This whole time, I had to go to the bathroom multiple times. Around 5am I began to see blood. In my other births, as soon as I saw the mucus plug, the baby had been born very soon. I thought it was probably time to call the midwives and set up the birth pool. All of a sudden, everything felt like it had to be done at once and I didn’t know what to focus on. We also had to think about who to call in case the kids woke up as it was getting to be morning. It all seemed so overwhelming and I didn’t know what to tell him to do first. (I am so glad we had the pool inflated and ready to go! All we had to do was fill it.) I went upstairs while my husband called the midwife and set up the pool. I emailed and texted some friends and family that I was in labor; I felt like I needed all the prayers and positive thoughts I could get. I stepped into the tub and Mairi walked in. I was so glad to see her. She started setting up right away, and for a moment left the room to get more supplies. I yelled that I was pushing already and started screaming. My husband asked if he should go tell her, which in the furthest reaches of my mind I thought was funny, because of course she knew I was pushing, I’m sure she’s heard that scream many times! She came back and reminded me to keep the sounds lower. I felt the head coming and my water broke. At some point, Erin had come in, also. With the head ready to come out, at that moment, my 7 year old woke up crying and my husband had to go up and get him! I couldn’t believe that the baby was about to come out and my husband was about to miss it! I tried with all my might to breathe and not let the baby come out before he got back. 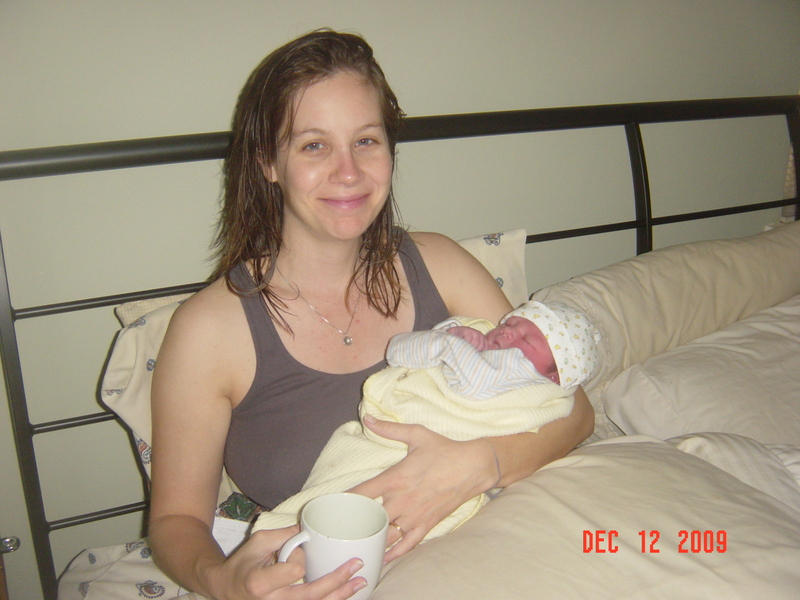 The midwives encouraged me in taking it slow. The pressure and burning were so intense, but I felt so strengthened just to have the midwives standing by, and feeling everyone’s support in the room, even though no hands were on me. Another couple contractions and the head was out and I could see it under the water with lots of black hair. I didn’t want to push out the body, it seemed too hard and it hurt so much. I made myself do it, and all of a sudden the baby was on my chest and was active and making noise and we were covered with blankets. I don’t remember who caught her, but my husband said I reached down and Mairi supported me. We didn’t know if it was a boy or girl, and it was slippery so I couldn’t take my hands off and move the baby to look. The midwives said just to feel with my hand so I could find out for myself- I couldn’t feel anything, and they said testicles would be pretty obvious so…I assumed it was a girl! At that moment is when my neighbor walked in to the sight of me in the tub with a minutes-old baby! She was born at just after 6am. We were helped out of the tub onto the couch to deliver the placenta. The baby started rooting right away and latched on soon and didn’t let go for a long time. We were cared for and I was brought lots of drinks and the baby and I were checked out. At some point my 4 year old son came downstairs and was ecstatic at finding out it was a girl, and eventually we cut the cord, and Erin showed us all the placenta, and the membranes and cord. At some point the baby had a big meconium poop all over me! Even though it turned out differently than I had envisioned, I couldn’t be more thankful for a healthy, safe birth, and such wonderful support during my pregnancy and afterwards from such knowledgeable and caring midwives. It wasn’t easy, or honestly, very enjoyable at the time, but it is truly a blessing to have experienced birth in my own comfortable surroundings, without any interventions, and have my husband and children included in all of my prenatal care and during the birth process and as we welcomed the baby after the birth. While the birth was a major event in our family life, and a lifechanging experience for me as a woman, at the same time, it was blissfully uneventful and normal.